With enough power to excel on all sorts of tracks and terrain, combined with an extremely lightweight chassis, the 250 XC has one of the best power-to-weight ratios in its class. The unrivalled performance of the lightweight 2-stroke engine makes it a true contender against the more complex 4-strokes. FOOTPEGS: Sophisticated ´No Dirt´ footpegs prevent smudging up the pegs, even when digging in deep ruts. Looking for a higher riding position? Then just mount the footpegs of the 2018 EXC models, which are 6 mm higher than the SX versions. CYLINDER: This compact cylinder with a 66.4 mm bore features a cutting-edge power valve unit with a sophisticated mechanism for the lateral support exhaust ports. Matched to a twin-component cylinder head, it is KTM’s secret to all-round grunt. The layout of the water jackets in the cylinder and head guarantees efficient heat dissipation when the going gets tough. 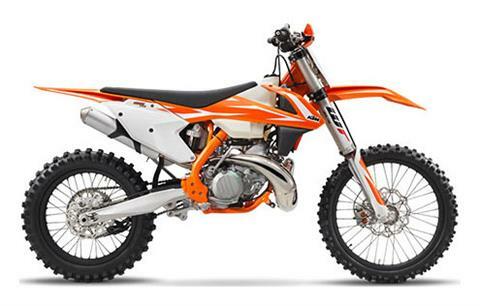 CARBURETOR: The KTM 250 XC is fitted with a MIKUNI TMX carburetor. This 38 mm flat slide carb lives to provide smooth and controllable power all the way up to the rev limitation. With a new intake manifold the carburetor is turned 7° in order to reduce the overflow of fuel. And it’s less sensitive to different altitudes and temperatures, so you can pin it wherever, whenever. ENGINE: The engine of the KTM 250 XC has been known and respected for being the most powerful 2-stroke engine in its class. 2-strokes really do have a future at KTM. Their outstanding power-to-weight ratio, low cost and simplicity see to that. The KTM 250 XC engine has been optimized for mass centralization comes with a twin-valve controlled power valve, a balancer shaft for less engine vibrations, a 6-speed transmission and a hydraulically operated DDS clutch. This compact racer truly outshines the competition with its ripping performance and is the right choice for lovers of low purchase and maintenance costs. Oh, and of course don’t forget that 2-stroke snarl when you’re on the pipe. BODYWORK: KTM R&D, KISKA Design and all our factory riders had their say in shaping the plastics with one goal: complete harmony between rider and bike. Perfect ergonomics and contact points provide maximum comfort in movement on the XC. The I-beam structures of the front and rear fenders guarantee maximum stability and a low weight thanks to well thought-out construction and mounting. They also stay cleaner for longer.